When it comes to war movies, there's one thing I thoroughly enjoy happening in them: killing them damn Nazis. And what do I love more than that? Killing Nazi zombies. 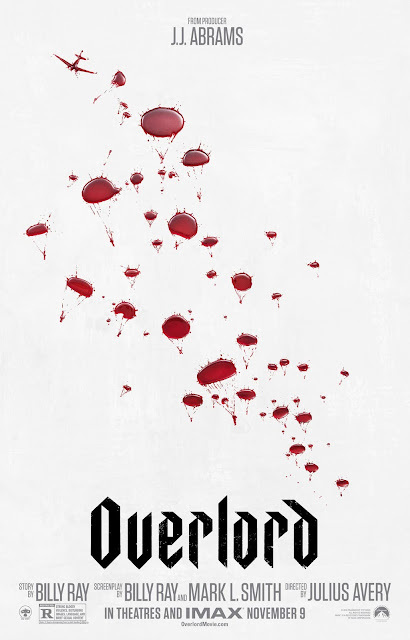 And that's what Overlord gives us, & it's so much fun. Set in 1944, the film follows Pvt. Ed Boyce (played by Jovan Adepo), a paratrooper. He, along with several other soldiers & Sgt. Eldson (played by Bokeem Woodbine), are on a plane heading to Germany on the eve of D-Day. However, their plane is shot down before they are able to reach their target: a German radio tower in an old church. There are believed to only be 5 survivors: Boyce; Cpl. Ford (played by Wyatt Russell); Tibbet (played by John Magaro); Chase (played by Iain De Caestecker); & Dawson (played by Jacob Anderson). As the team marches onward, they are seen by a French woman, Chloe (played by Mathilde Ollivier), who takes the paratroopers to her house in the village where the radio tower is located. Chloe lives with her 8-year-old brother, Paul (played by Gianny Taufer), & her aunt, who is gravely ill.
Not long after, a Nazi patrol arrives at the house, led by Capt. Wafner (played by Pilou Asbæk). He is performing a routine inspection. While the soldiers hide in the attic, Capt. Wafner comes in & tries to assault Chloe. Pvt. Boyce then comes out & stops him. Pvt. Boyce then leaves for the rendezvous point, but finds something very disturbing when he arrives there. He finds that the Nazis have been experimenting on village residents & dead Nazi soldiers with a serum. Now that they know this, they must stop the Nazi experiments & destroy the tower at all costs. The cast is fantastic. Jovan Adepo is showing that he can shine in a lead role. Pilou Asbæk is menacing. And the rest of the cast provides great supporting roles. Julius Avery's direction is excellent. Avery brings a lot of tension to the film, & also provides a lot of perfectly timed scares. The screenplay by Billy Ray & Mark L. Smith is amazing. The plot is always intriguing, the characters are fully realized, & the dialogue is terrific. The sound design is incredible. The sound is loud & in your face, with every gunshot & every explosion sounding like you're only feet away from them. And the visual effects are stunning. The CGI is very well-made, especially for the zombies, & the more practical effects are very well-done. This is an absolutely fun film. While being well-acted & well-made, it provides so many thrills & scares that I couldn't help but love it. Overlord was seen by me at the MJR Marketplace Digital Cinema 20 in Sterling Heights, MI on Saturday, November 17, 2018. It is in theaters everywhere. Its runtime is 110 minutes, & it is rated R for strong bloody violence, disturbing images, language, & brief sexual content.